Dan has an undergraduate and masters degree in Biomechanics and a Ph.D. in Neurophysiology from the University of Colorado Boulder. Over his academic career Dan has published 14 papers. Dan also stays very active in the American Society of Biomechanics. When he’s not working on academic papers, Dan is an accomplished triathlete with multiple national top 20 finishes. Dan is also a research scientist with Athos. He designs experiments and studies to better understand how our sEMG and acceleration signals can be leveraged to help coaches improve training for their athletes. Anytime humans want to move, our brain sends an electrical current to the motor neurons in the ventral horn of the spinal cord which has an axon that projects to the muscles. The muscles in turn must pull on the tendons or bony landmarks to which they are attached to actually generate the movement. If enough current is supplied to a neuron in the spinal cord, an action potential will propagate down the axon (which runs along a peripheral nerve), and to the muscle where a finite number of muscle fibers will contract. There are between 100-4000 motor units that innervate all the fibers in a given muscle and this differs based on the function and location of the muscle. Figure 1. Schematic of a motor unit. The motor neuron is in the ventral horn of the spinal cord where its dendrites act as information receptors. If enough electricity is provided to the motor neuron, an action potential will propagate down the myelinated axon to the muscle and innervate a finite number of muscle fibers (4 in this simplified example). In order to increase our force, our motor neurons will discharge action potentials more rapidly (this is referred to as rate coding) or additional motor units will be activated by the nervous system. Motor units are recruited in a fixed order (Henneman et al., 1954) from smallest to largest due to the progressive increase in input conductance as the size of the neuron increases. 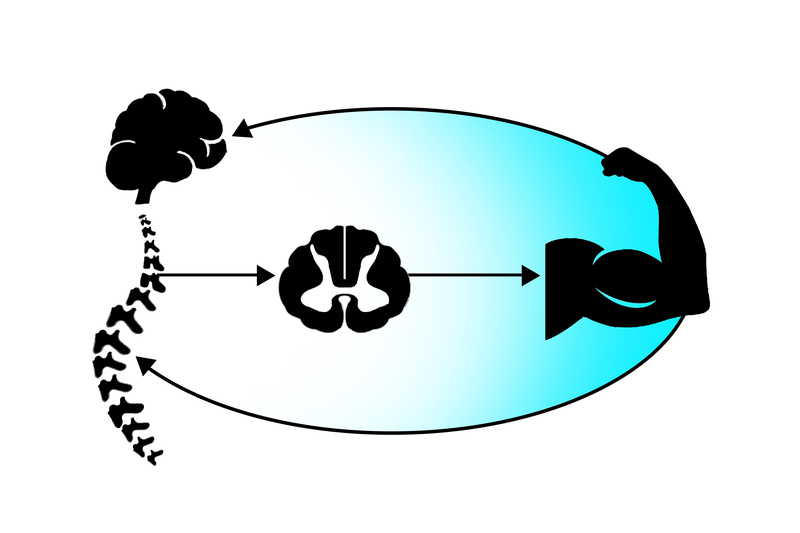 Larger neurons also innervate a greater number of muscle fibers, so later recruited units can produce more force. This is a beneficial for human force control. We have all tried to pick up something that looks heavy but is actually light and we lift it too rapidly. In this same way, one does not recruit many fibers for a low level force contraction such as lifting a coffee cup (or risk spilling). A typical discharge rate for motor units is between 10 and 60 pulses per second. Each motor unit action potential has a distinct shape (amplitude and number of zero crossings) relative to a recording electrode. A schematic overview of this process can be seen in figure 2. There are two separate tasks (A) shows a steady force output, while (B) shows a linearly increasing force. The control scheme from the motor units is displayed: in panel A, a motor unit is discharging action potentials at regular intervals. In panel B, a second unit is recruited as force increases (and the first units discharge rate increases). The algebraic sum of these motor unit action potentials results in the surface EMG signal. Figure 2. Schematic overview of motor unit recruitment. There are two tasks: A. requires a subject to maintain a steady force output. There is a motor unit discharging an action potential at regular intervals during this time. B. The second (right), is a linearly increasing force output. An additional motor unit is recruited while the first unit increases its discharge rate. C. Shows the motor unit action potential shape of both units and their sum, which contributes to the surface EMG. Starting in the late 1700s, it became apparent that an electrical current was required to perform a muscular contraction. Most people credit Etienne Marey with coining the term electromyography (EMG) around 1876. In 1929, Adrian and Bronk created a concentric needle electrode that could be inserted into a muscle to could record action potentials from single motor units in human subjects. Various advances of this technique were developed over the years, and John Basmajian published a book in the 1960s, Muscles Alive, which formed a collated resource for those interested in EMG. Many iterations of EMG systems have come about including high-density and intramuscular EMGs, but Athos is one of very few that embed the sensors into wearable clothing. Figure 3. Overview of force production. A motor neuron in the ventral horn of the spinal cord receives enough current to discharge an action potential causing a muscular contraction. Athos measures the summation of these action potentials at the muscle. 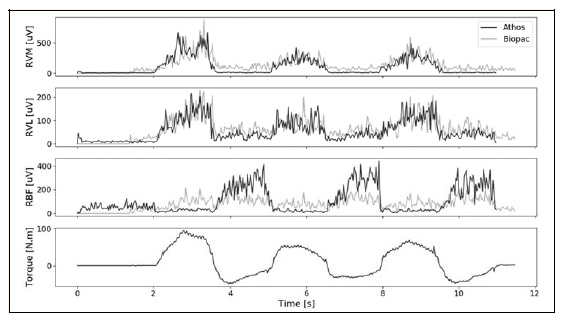 This signal provides insight into the amount of time a muscle is active and the intensity of its activation. 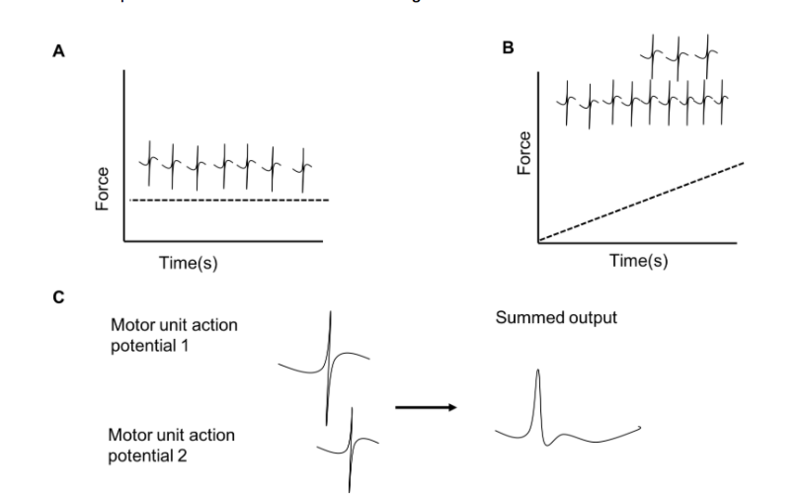 Surface electromyography records the electrical activity due to the discharging of action potentials from motor units as shown in figure 2. A bipolar electrode is placed on the skin above a muscle belly and can detect electrical activity a given distance from the origin. The output is the surface electromyogram (sEMG), and represents the algebraic sum of action potentials (Day and Hullinger, 2001; Keenan et al., 2005). There is a small delay between the onset of EMG activity and force production, however during sustained contractions there cannot be force without EMG activity. A main challenge of the EMG signal is its interpretation: what can we use it for? 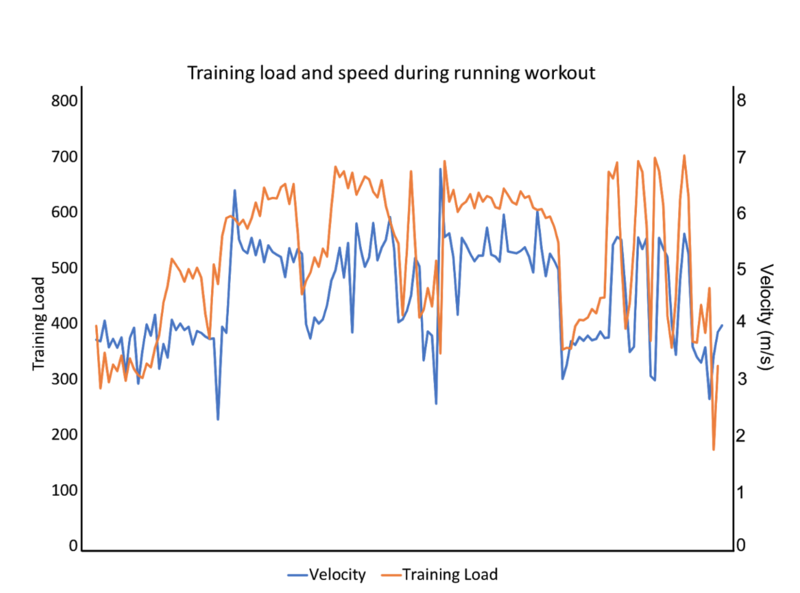 Because there is a strong (albeit nonlinear) relationship between sEMG and force production by a muscle, Athos provides an easy and versatile method to quantify the amount of electrical force a produced by the muscle and this can be used in a variety of ways to better understand the impact and outcomes of athletic training. To date, there is no other system with the ability to understand muscles in the weight room, the training room and in sports-specific practices. Using this muscular activity, Athos can provide insight into imbalances across the body and ratios between the EMG signal produced by each muscle. All of this helps both coaches and athletes understand the physical impact of their training. This enables coaches to manage the accumulation of load on the body, understand injury risk and know where to focus any recovery. If you’d like to learn more about how to use Athos to train your athletes please click here.